Washburn Alumni Association Distinguished Service Medal awarded to Mamie Williams, an African American woman who taught in Topeka, Kansas, schools from 1918 to 1960. Born in South Carolina, Williams moved with her family to Topeka in 1899. She studied mathematics at Washburn College, where she was the only African-American in her class. Williams began teaching in the Topeka area in 1918 and remained there for 42 years. In 1973, she was awarded the Washburn University Distinguished Service Award. 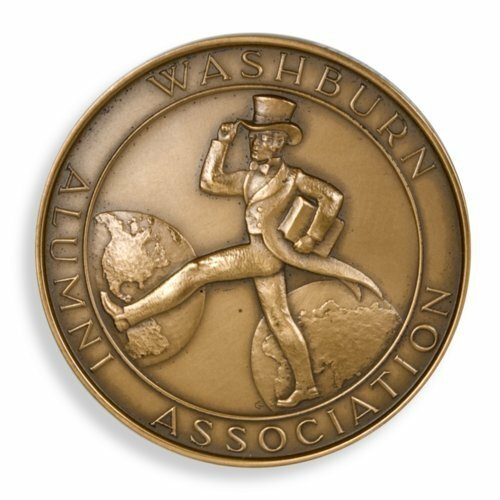 The Washburn Alumni Association awarded this medal to Williams in recognition of her contributions to education. The Medallic Art Company of New York manufactured the medal. Founded in 1903, the company was well known for minting prestigious awards such as the Pulitzer Prize, the Peabody Award, and the Newberry Medal.